Alisa Miller discussed America's parochial, shallow perspective. She sampled news coverage one month, when the global news included a devastating flood in Indonesia and, in Paris, the release of conclusive data confirming the acceleration of global warming. In the U.S. these stories were completely dwarfed by coverage of Anna Nicole Smith's death, a story that received more coverage than all the news associated with every country in the world other than the US and Iraq. Yesterday, the first session, What is Life?, began with Craig Venter, who had first sequenced the human genome. Craig presented his current work synthesizing life. First he described a 5,000 letter (ATCG) bacteriophage that his lab was able to manufacture by inserting the sequence into e.coli. His lab then developed strings of protein that glued different genes together, so that they could now stitch together any of the 20 million genes that have since been discovered. They have already crafted a life form 500,000 letters long, based on algae methanococcus, that transforms carbon dioxide into methane fuel. The lab hopes to ultimately increase the original bacteria's metabolism a million fold, a scale that can potentially serve our energy needs. TED Curator Chris Anderson asked Craig, "Can you be accused of playing God?" to which he answered "Oh, we're not playing." Other applications of life synthesis include production of vaccinations, and hardier food. Craig views himself in part as a spokesman to pave the way to public acceptance of these technologies. "Europeans now want DNA-free food." Next, Microsoft announced World Wide Telescope, a 2.5D rendering of the universe based on all the available astronomical photographs available. Users can fly through the universe and zoom in, building tours for others. Interesting. Paul Rothemund, a molecular programmer, then ilustrated the art and science of DNA origami, an organic nano-technology. His team has demonstrated that long strands of DNA can be folded into any shape at all by mixing in short strands of protein that pinch the long strand at just the right point. He showed a schematic he had drawn for folding a strand into a smiley face (or rather, a circle missing only two holes for eyes and a curved trench for the smile). Then he showed videos of the tiny molecules that resulted when he folded the DNA strand according to his schematic. Amazingly, we saw little yellow smiley faces floating around. 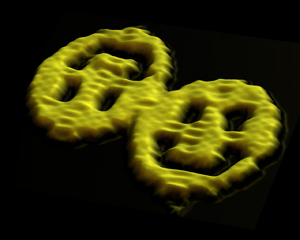 Rothemund's team then developed software so that anyone can fold DNA strands into shapes. Lulu Qian, a student in Shanghai, used the software to spell DNA (using DNA). Rothemund used the software to build a tiny switch, the equivalent of a transistor. He aggregated the switches into counters and memory cells, crafting organic memory chips of any arbitrary size. I don't even know what to say about such genius. As one of the interstitial musical performers put it, TED presentations both inspire and depress as you realize how relatively little you've done with your own life. Dr. Dean Ornish gave a short lesson on the importance of lifestyle in overcoming our genetic fates (at least for a short time). My takeaway: stress and saturated fats kill brain cells; chocolate, tea, and blueberries stimulate new brain cell growth. Susan Blackmore presented her perspective on memetics, a framework for describing evolutionary systems beyond simply the one organic system Darwin discovered. Blackmore's work, based on an afterthought Richard Dawkins shared at the end of The Selfish Gene, is an interesting perspective for looking at any system that includes reproduction, mutation, and competition. Critics of memetics like to point out that memetics is hardly a useful science. Still it's a fun one to exercise. Personally I have come to view startups as mutated scions of incumbent companies that compete for dollars in the economy. Like most mutations, new business plans are usually doomed, but occasionally one thrives and dominates, breeding similar entrants. I can't recall the name of the person who gave the next brief presentation, but it was an impressive description of a new technology called neuroimaging therapy. By showing a patient an MRI of her brain in real time, the patient can learn, through biofeedback, how to head off thoughts or sensations that lead to pain, anger, depression, or addictive impulses. He claims a 50% success rate in curing chronic pain through neuroimaging therapy. Doris Goodwin, a scholar and author of presidential history, gave a wonderful talk comparing Abraham Lincoln to Lyndon Johnson. She framed the talk around the claim that personal happiness requires a commitment to work, love and play. Borrowing from her latest book, she shared anecdotes about Lincoln's bout with depression in his twenties. Doris weaved in wonderful stories about her own childhood and her times working for President Johnson. The talk didn't really make any sense--the stories and points did not coherently tie together--but it was still worthwhile to bask in her clever and amusing collage of words. The flu prevented the Harvard evolutionary psychologist Nancy Etcoff from attending, but a stand-in presented the purpose of her book Survival of the Prettiest. By examining people's ideas of beauty, the book identifies commonalities across culture, and demonstrates the extent to which beauty is hard-wired in human beings, as observed even in infantile reactions to a pretty face. "Even babies are shallow." Etcoff's moral is that if we understand the elements of human attraction, we can enjoy beauty without letting it obsess us. 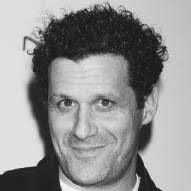 Fashion designer Isaac Mizrahi came next. This time I was really ready to catch up on my email, especially as he began his rambling stream of consciousness. But the guy is amusing and he grew on me. He had lots of funny stories and he never took himself too seriously. "Style is great if it's amusing." Particle physicist Garrett Lisi closed the session. Garrett is an avid surfer who lives and works in a van on the beaches of Maui. He compares physics experiments to startups, since they hold great promise but they usually don't work. The connection to beauty is that Lisi is pursuing the grand unified theory of physics by advocating a mathematical model of the universe that isn't proven, but it's so elegant and beautiful that physicists like Lisi believe that it's most probably correct. (As Dr. Suess wrote about Horton's egg, "It should be, it should be, it should be like that.") Lisi proceeded to describe the 8-dimensional shape called an E8 that seems to frame the properties of the 226 different configurations of the known elementary particles. The vertices of an E8 also define several other particles that haven't yet been observed but, Lisi hopes, will be observed when the new 27-mile Hydron particle collider comes on line later this year. "If we don't find those particles, it won't be good for me personally." Bottom line: Craig Venter and Paul Rothemund were Thursday morning's highlights.